We are a little behind the eight ball in my house when it comes to roller skating. Honestly, it never occurred to me that kids these days are still interested in skating! Therefore, I really did not think much about teaching my daughter how to roller skate. So, of course, she has started getting invited to roller skating parties. Yikes!!!! After watching her take way too many nosedives during two parties (thank God for helmets! ), I decided that it is time to rip the band-aid off and teach this kid to skate. One mom suggested drop-in skating classes at Orbit Skate Center in Palatine. I thought: "This is perfect, we have to try it!" Since beginner drop-in classes are Saturdays, I decided to give it a try yesterday. The one hour lessons are only $3.50 including the skate rental. Awesome! We gladly paid our admission fee and grabbed some skates. Then, I helped my daughter get into her gear (helmet, knee pads, and skates) and walked with her to the rink. As I helped her onto the rink, one of the employees let me know that I could go with her. At first, I was caught off guard---I thought that she would be doing this herself! I saw that all of the other parents were on the rink so I moved forward thinking--maybe I will not be mangled after this adventure after all. The instructors were great with the kids. They explained all the basics---skating, picking yourself up after a fall, stopping, starting from a stop, skating backwards, and skating etiquette. With each new skill, they had the kids skate around to practice it. They were good at encouraging the kids while helping them develop technique. By the end of the class, my daughter's skating had noticeably improved. She was able to balance a lot better on her skates and did not need to hold my hand. She still has a way to go, but I am now more confident in her ability and am not worried that she is going to send me to the hospital if I skate with her! I will be bringing my daughter back to skating lessons over the next couple of weeks. It is an affordable and effective way for kids to learn how to skate! 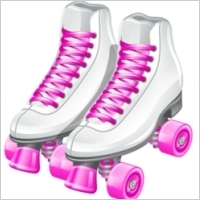 Orbit also has open skate times available throughout the week. With the beginning of frigid days ahead, we will probably head over for some of those sessions as well! It sounds like you guys had fun. Before you know it she will be zooming around you while skating backwards. Yes, I am sure that she will be skating circles around me soon! I think that she has already surpassed me in the technology arens! Lol! Hi there! I came across your blog from the Tuesday Blog Hop and was delighted to find a fellow blogger in my area! I take my kids to the Orbit Skating lessons too! You can't beat them! My four year old daughter wants to skate on her own so bad so they are perfect for us! If you have a chance come check out my blog, http://www.bargaingab.com. I'm following your RSS feed now - great blog!! Hi, Kim! I am following you through GFC and following your feed. Yes--the lessons are the best! They are cheap and the kids get to learn without the faster skaters zooming by. Maybe we will run in to you at the lessons some time!